Bermuda show jumpers are preparing to compete in the 41st edition of the FEI Jumping World Challenge [JWC]. Effective from 2019, the title name of the series was changed slightly in order to stay in line with the FEI’s new corporate identity. 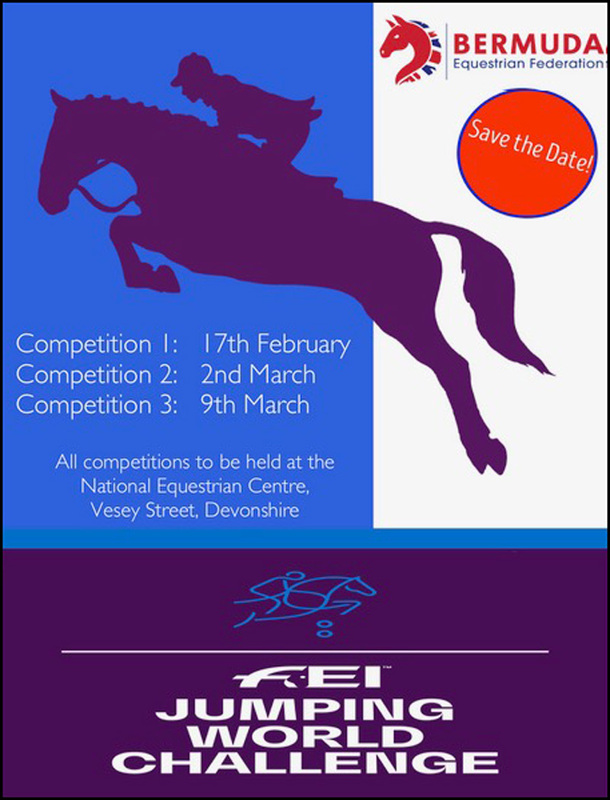 The series is now referred to as the FEI Jumping World Challenge and is no longer the FEI World Jumping Challenge. The Challenge provides local jumper riders with an opportunity to compete in an international setting without having to leave their country. Riders from ten different geographical zones compete over the same jumping courses designed by an FEI appointed course designer. This year’s course designer is Mr. Rakshan Radpoor of Iran. FEI Judge Judy Hagen of Bermuda will judge Competitions 1 & 2 and FEI Judge Sara Lynn McCartney from Trinidad &Tobago together FEI Judge Judy Hagen will adjudicate Competition 3. The three categories are open to all athletes from the beginning of the year in which they reach their 14th birthday. Ten Bermuda riders will compete in this year’s FEI World Jumping Challenge, with representation in all three jumping categories. Bermuda was very successful in the 2018 FEI WJC with Philip Correia riding Emerson capturing 1st place in the Overall Top Category “A” for Regional Zone 10 division. As such, he has qualified to compete in the finals to be held in Ecuador from 10th – 15th September 2019. Spectators are most welcome and there is no admission charge.